Every once in a while I get on these little kicks and make super healthy food. I wouldn’t say that I am characteristically a health food person, but it happens once in a while. 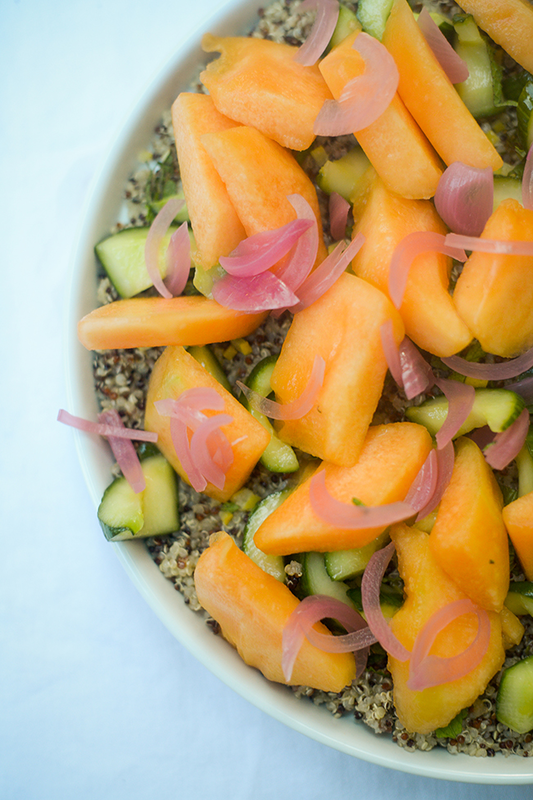 Let’s just say that I was on a healthy streak when I came up with the salad of quinoa, melon, cucumber, onion, preserved lemon, and mint. 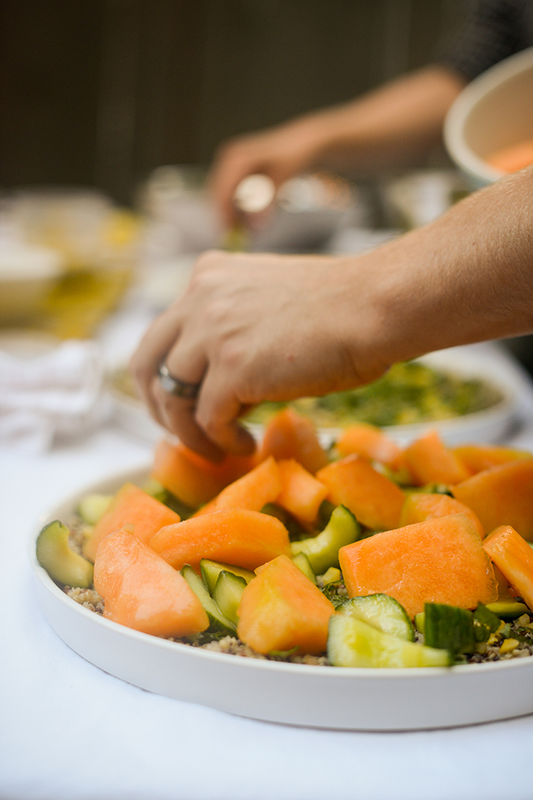 The salad was inspired by two things, mainly super juicy peak of the season Brigham City melon and tabouleh. 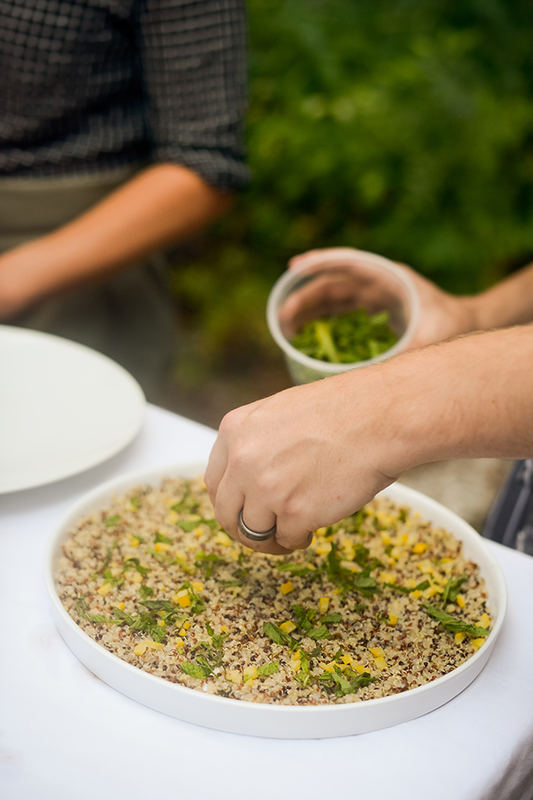 Tabouleh is normally made with Israeli couscous, parsley, mint, lemon zest, onion, etc. 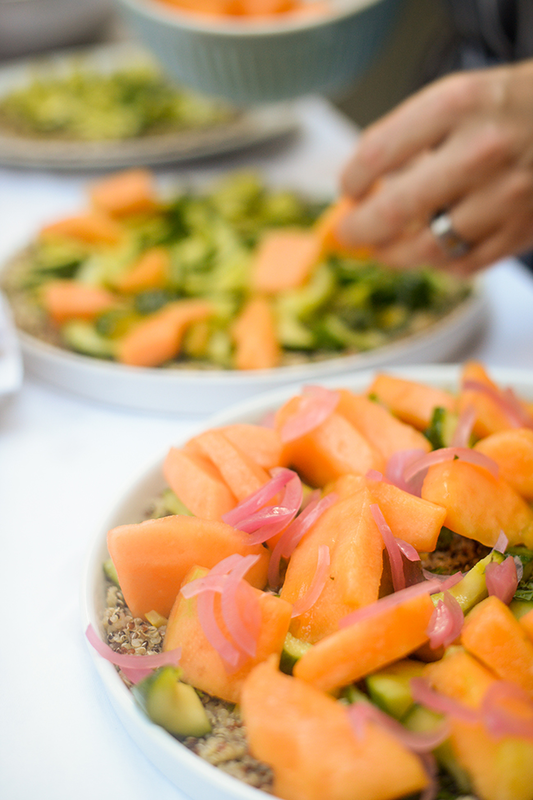 When I made this salad Brigham City melons were at the peak of their season (big, juicy, sweet, absolutely delicious) so I want to those guys to be the star of the show. 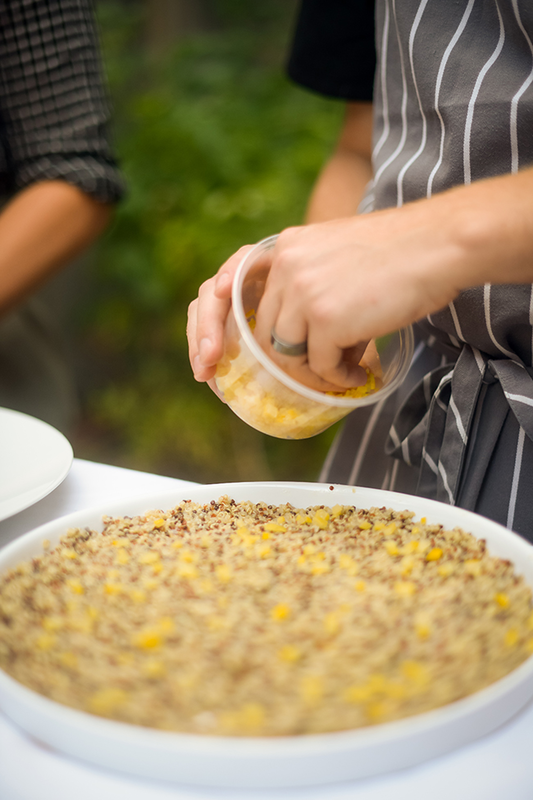 – First rinse the quinoa. If you don’t, the quinoa will have a weird bitter flavor and taste as if weevils got into it. That’s just something on the husk of the quinoa that makes it taste that way. If you rinse it off first, that goes away. 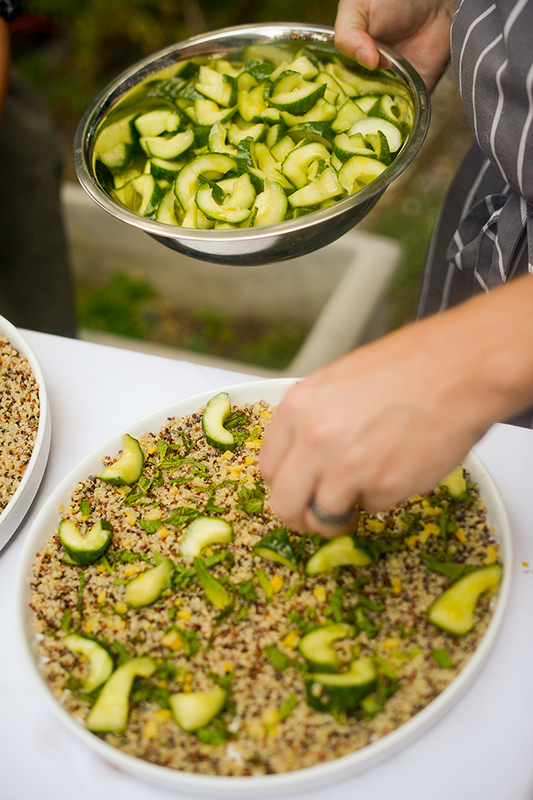 – Mix two parts water one part quinoa into a pot with a lit that covers it tightly. – Bring the water up to a boil. – After it has reached a boil, simmer the quinoa on very very low for about 16 minutes. 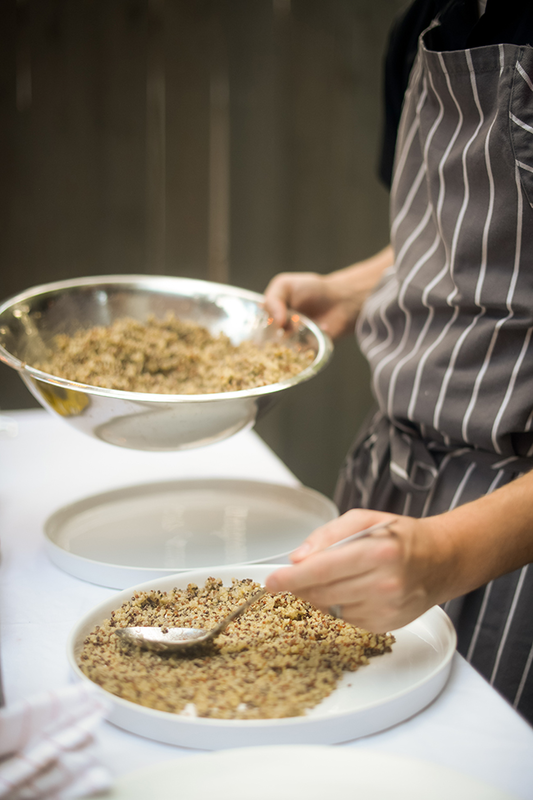 – The quinoa should open up become soft and then you let it sit in the pan for about another five minutes after it cooks to absorb all the water. – Lay that all out on a sheet pan to let it cool at room temperature. Then you can put it in the refrigerator after it cools off. Bring this liquid up to a boil. I should say that this is just a very basic pickling liquid for hot or cold non-fermented pickles, but you can also add stuff to it depending on how creative you feel (spices, aromatics, a little bit of garlic etc.). Sometimes I like to put dried chilies, or a bit of star anise, or peppercorns. This is a very basic liquid that you can use for just about anything and add whatever you want to it depending on the application. So, you have the pickling liquid, you brought it up to a boil. Just let it sit there. For the pickled onions, slice the onions super thin and while the pickle pickling liquid is still hot, pour some of the hot pickling liquid on the onions. Just enough to cover them. You can use the same pickling liquid cold for the cucumbers. I like to take the cucumbers, slice them length wise, scoop out the seeds, and then cut them in kind of big chunks. Then pour the cold pickling liquid over the cucumbers so they can marinate. So you have pickles that were made hot which were onions and pickles made cold which were cucumber. For the melons, make sure you wash the melons really well. Peel them, cut them in half, scoop out the seeds, and cut those in really big chunks. What I did for the melons was put them in one of those food saver storage bags (or a Cryovac bag) and I vacuum sealed them was just a couple tablespoons of that pickling liquid so that they take on a light pickle flavor as well. I recommend this recipe for the preserved lemon. 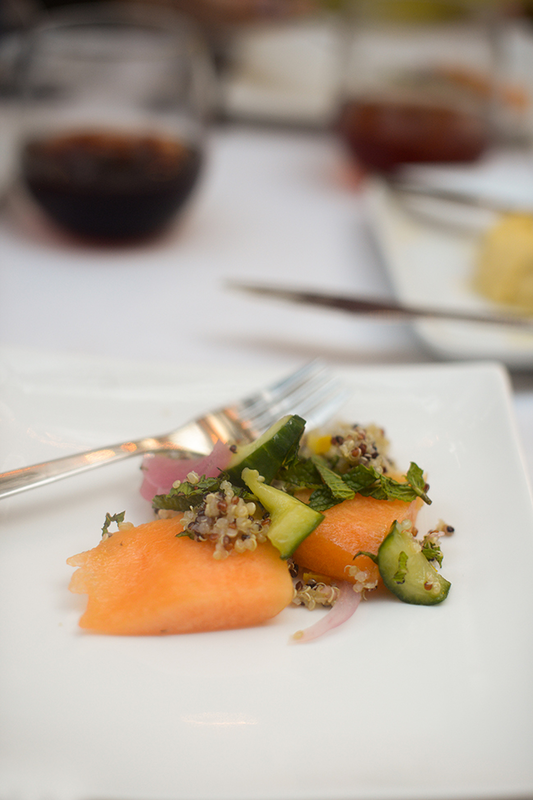 When you plate the salad, put down a little bit of the quinoa on the bottom of the plate. Add little bit of diced preserved lemon. You scatter a whole bunch of torn up mint leaves on top of that. And little pieces of onions scattered around. You can even put more mint leaves on top of that with a little bit of olive oil and sea salt garnishing everything. This salad turned out better than I hoped. You feel kind of healthy eating it, but it also feels good to eat well and to eat healthy food that’s just plain delicious. Sometimes I get sad when I go out to eat and order food that’s supposed to be super healthy but it doesn’t taste real nice. So I’m glad this didn’t turn out like that. If you try this and you need some help or advice feel free to shoot me an email and I’ll help you with the process. Feel free to build on it and make it yours. If you do try this, or any other recipe, I’d love to see your hard work. Tag me on Instagram @foodmadebytom.